Votre navigateur ne g�re cet �l�ment. 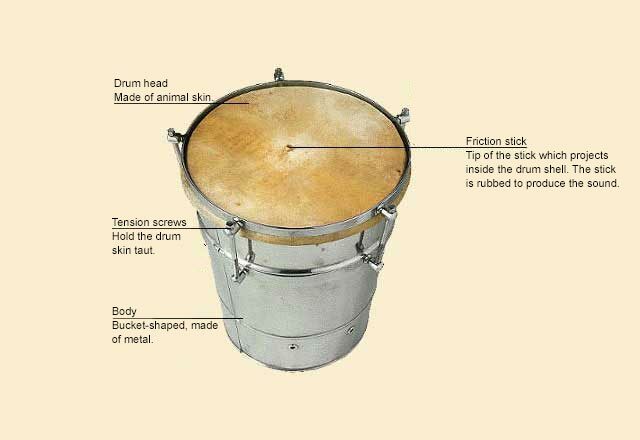 The Cuica is a friction drum from Brazil. A stick is fixed in the center of the drumskin and projects inside the shell. The sound is made by rubbing the stick between your thumb and forefinger with a damp sponge or piece of leather. This rubbing action makes the drum skin vibrate. The cuica plays an important part in traditional Brazilian dance music. Metal drum body, with animal-skin drum head. The cuica was probably brought to Brazil by Bantu slaves, although it had been known in Spain and Africa for centuries. In parts of Latin America it is also known as the puita, boi, or onca. Its origin may lie in the way blacksmiths used their bellows, pushing the handle with moist hands. Membranophone: an instrument that produces its sound by the vibration of a stretched skin. The cuica is often used to accompany the Brazilian dance, the samba.